If you aren't a fan of Microsoft applications on Apple devices, Microsoft has an announcement with you in mind. The company has updated its Outlook email client for Mac users and it will introduce a new version of Office for Mac by the end of 2015. The updated Outlook tool features improved threading, a new interface and online archiving that will help you find old emails on the Outlook web platform. The goal of the launch is to provide a more consistent experience across PC and Mac devices, according to Microsoft. 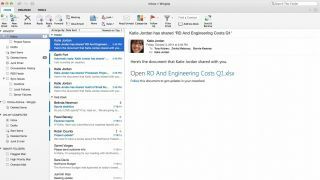 The new Mac interface will look and feel similar to Outlook on PC. The new interface will include improved scrolling and agility when switching between Ribbon tabs, Microsoft said. It will also feature Master Category List enhancements that will enable users to name and color lists that sync between all Outlook clients. The update is readily available at no additional cost for Office 365 commercial customers and Office 365 Home, Office 365 Personal and Office 365 University subscribers. In the first half of 2015 Microsoft says it will release a public beta for the next version of Office for Mac. The final release will be available during the second half of the year, the company says. Office 365 commercial and consumer subscribers will get the next version at no additional cost.